A battle group from the Russian Pacific Fleet set out on a tour of duty. The Admiral Vinogradov large ASW ship, the Pechenga and Boris Butoma tankers, as well as the Foty Krylov tugboat will participate in the joint Russian-Indian INDRA-2009 naval exercise. Following the exercise, the Russian warships will head for the Gulf of Aden, where the Admiral Vinogradov is to replace the Baltic Fleet's Neustrashimy frigate. 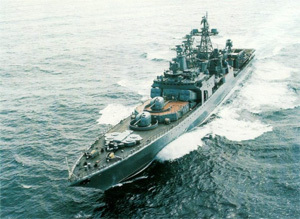 The exercise will also see participation of such ships in service with Russia's Northern Fleet as the Pyotr Veliky large nuclear-powered missile cruiser, the Admiral Chabanenko large ASW ship and auxiliary vessels, which headed for the Indian Ocean after completing the joint Russian-Venezuelan VENRUS-2008 exercise. Currently, ships representing three Russian fleets (the Northern, Baltic and Pacific) are simultaneously on long-distance tours of duty. A task force from the Russian Black Sea Fleet will soon head for the Mediterranean. This is a concentration of Russian navy tours not seen since the break-up of the Soviet Union. The increased activity of the Russian navy beyond Russia's territorial waters raises questions concerning rationale, objectives and further developments. The reason is actually quite simple: the Russian navy has come back to world oceans now that it has the fuel and the money to keep its ships combat ready. Objectives have been announced repeatedly. Among other things they include flying the Russian naval flag and restoring Russia's military presence in key areas. "The tour of duty performed by the Pacific Fleet's battle group will demonstrate Russia's ability to duly fly its naval flag and ensure protection of its national interests in the world theater, as well as to guarantee stability in the Asia-Pacific Region," Captain 1st Rank Roman Martov, the head of the Pacific Fleet press center, said. Besides, another goal of no small significance is combat training of ship crews. Unfortunately the long hiatus without any tours has resulted in a considerable decrease in the efficiency levels of commanding officers. The situation has come to a point where ships and submarines have never taken the sea without a senior officer present (usually a divisional (squadron) chief of staff, commanding officer or his deputy). However many divisional commanding officers, who made their careers in the 1990s, do not have the necessary experience themselves. This will be full of serious consequences if the Russian navy has to conduct combat operations against a more or less formidable opponent. History shows that a lack of experience cannot be compensated for with firepower or the number of ships. The Russian navy suffers from the latter and will face problems with the former as its warships grow obsolete. At the same time, one tour of duty or a series of such tours cannot solve the problem. What is necessary today is constant long-term training, which will gradually allow raising a generation of naval officers - from an admiral to a lieutenant - for whom long-distance tours and exercises with live fire will be routine and who will spend most of the time at sea while receiving adequate compensation. "It takes three years to build a ship, but 300 years to build a tradition," these words of British Admiral Cunningham are true for any navy. This officer in the world's greatest naval power knew what he was talking about - the name of Cunningham is well known to any admirer of history of naval battles of World War II. The much discussed production of new ships for the Russian navy does not mean anything by itself, if efficient crews, feeling at home at sea, have not been trained. That is what the Russian navy is engaged in now. And the task does need the assets allocated to this end.